Peaceful Lakeside Home on 6 acres. This is the place you are looking for--once you come, no other rental will do. Hammond pond is a seasonal private lake that no motorized boats are allowed on. Watch the wild geese raise their young or the deer graze in the meadow. Our home has a fully stocked Granite kitchen, Tempurpedic mattress in master, and stone fireplace (gas). This place has it all--views, trees, meadows, wildlife, walking trails (dirt road), seasonal lake for kayaking or canoes. Quaint newer home with incredible charm--gas BBQ, covered porch. Hammond pond is a seasonal 70 acre lake that attracts wildlife and local fishermen. Nestled between Mount Shasta and Black Butte to the east and the 'Eddys' to the west, abundant day hike opportunities exist. If you are not up to climbing the 14,000 ft Mount Shasta, the Pacific Crest Trail offers many easier day hikes--one of my favorites is from the top of Stewart Springs road to Deadfall Lakes--an easy, relatively flat 4 mile (one way), spectacularly beautiful hike. The 'Park's Creek' trailhead is about 30 minutes from the house. Another gem is the McCloud Falls trail--make sure you don't miss the Middle Falls! McCloud is about 15 miles east of Mt Shasta City on Highway 89. The Falls are a few miles east of McCloud at the 'Fowler's' turnoff. There is also a maze of dirt roads to explore that connect the homes and properties of 'Hammond Ranch'. Besides the Lake, many creeks flow through the Ranch--the Shasta River (just a stream at this point), Dale Creek and Eddy Creek. Following Dale Creek road past the house to Dale Creek, crossing Dale Creek (you have to wade) and then on to Eddy Creek offers a wonderful 8 mile round trip. Hike or mountain bike along a minimally travelled, relatively flat, bumpy dirt road. Wildflowers abound and the road winds along a hillside that offers dramatic views of Mount Shasta and the valley. You may take quads along the roads--but please observe the 15 mph speed limit on the private roads. Whether you use our home as a base camp or a place to unwind, you will find that you don't want to leave the spell that it casts over you. When I have guests the most common thing I hear in the morning is 'How do you leave this place to go to work?' This is not just a place to stay--it is a destination! We built this home in 1994 after purchasing the property in 1992. Once you come you will know why this property was the one we would never let go of. He always loved flat land and I always loved views...the minute we walked onto this land, we knew we were staying. We designed this home to take full advantage of the views of the lake while minimizing the road. Because this is a small home, we also did not want to waste space with hallways. Both bedrooms are mini-suites at opposite ends of the house. The guest bedroom has its bath just steps from the door. This bath is the main bath for the house. 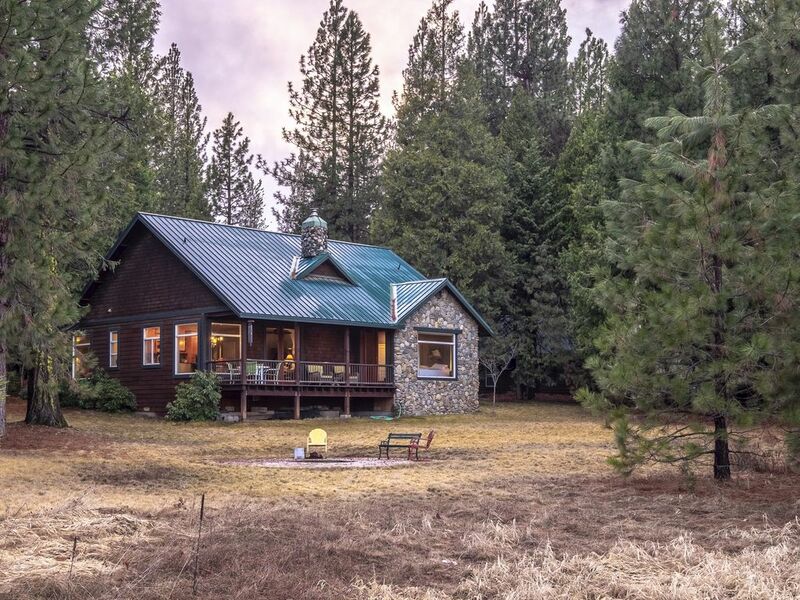 Only about 3 miles from Interstate 5, but has very private, rural setting. No neighbors can be seen from house but are as close as across the road. Filtered view of Mount Shasta from Kitchen, fabulous view from property. Thank you for the wonderful weekend. Unfortunately, the rain got the best of it. Love the home and all accommodations. We were very impressed with this beautiful lake house. It was so beautiful and peaceful and the Lakeview was amazing! The house was very well stocked and we just loved all the beautiful details everywhere you look. We really enjoyed making s'mores in the firepit on the lake and exploring the property and the views. We were a little sad to leave and would definitely stay again when we are back in the area. This property is absolutely wonderful. The pictures barely scratch the surface. We used it as a home base to explore the region. It's situated very well to see and do things both in northern California and southern Oregon. Towards the end of our stay, we realized just staying in and enjoying the home was just as perfect. So whether you want to just stay in and unplug from the world, or strike out to explore, this property will have you covered. Sylvia is terrific! The owner was as available as you need- and provided great information for the nearby towns. The home is really very nice; however, it is somewhat mis characterized as a “lakeside” house. A more straightforward description would be that it is “adjacent to a seasonal man-made reservoir,” inasmuch as the reservoir appears to be completely dry for at least half of the year and perhaps more. Aside from that, the house is very pleasant and in a desirable location. This is as our third stay at the Stone Cottage and does not fail to impress with superb accommodations and location. Although the pond was dry the autumn colors were fantastic. We will make a point of returning next year in the autumn.